Get ready to send the biology textbooks back to the printer. In a new paper published in Nature, Benjamin Van Mooy, a geochemist with the Woods Hole Oceanographic Institution (WHOI), and his colleagues report that microscopic plants growing in the Sargasso Sea have come up with a completely unexpected way of building their cells. Until now, it was thought that all cells are surrounded by membranes containing molecules called phospholipids – oily compounds that contain phosphorus, as well as other basic biochemical nutrients including nitrogen. However, Van Mooy and his colleagues from WHOI, the University of Southern California, University of Hawaii, the Czech Academy of Sciences, the Bermuda Institute of Ocean Sciences, University of Southern Maine, and the Centre d’Océanologie de Marseille have found phytoplankton in the Sargasso Sea that make their cell membranes without using phospholipids, using non-phosphorus-containing ‘substitute lipids’ instead. These substitute lipids were once regarded as merely a molecular peculiarity of phytoplankton grown in the laboratory, but are now recognized to be used by phytoplankton throughout the world’s ocean. Substitute lipids “are the most abundant membrane molecules in the sea and they were essentially unknown until now,” says Van Mooy, whose work at WHOI was supported by the National Science Foundation, the Office of Naval Research, and the WHOI Ocean Life Institute. The finding could help rewrite the fundamentals of cell biochemistry. The Sargasso Sea is in the middle of the Atlantic Ocean – an area known for its short supply of phosphorus and nitrogen. A molecule of phosphorus dissolved in the Sargasso Sea remains there for perhaps an hour or two before a phosphorus-starved cell greedily absorbs it. For comparison, in the Pacific Ocean phosphorus may linger for nearly a year before being used by plankton. 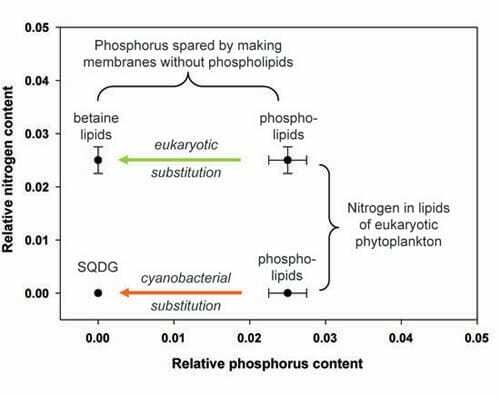 Van Mooy found that cyanobacteria aren’t the only class of plankton building phosphate-free cell membrane lipids. 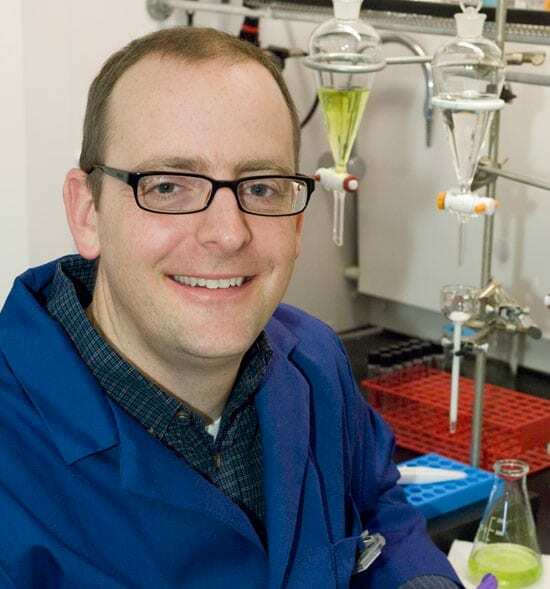 When he and his co-authors studied the more complex eukaryotic phytoplankton in the Sargasso Sea they found “this whole other class of substitute lipids, which were betaine molecules. We are the first people to report finding these molecules in the ocean.” These betaine molecules have structures that resemble amino acids, the building blocks of proteins. But unlike the cyanobacterial SQDG, the betaine lipids require nitrogen. The more structurally sophisticated plants have dodged the phosphorus requirement, but they still have to have nitrogen. Van Mooy thinks he’s on to something fundamental about the ways that phytoplankton survive in the ocean. Of his future research working out the dynamics of the membrane lipid substitutions Van Mooy says, “You could think of it like a tool. Something very basic. Maybe there is an underlying principle here that we will uncover.” Hold the presses on the textbooks until they do. oceans’ role in the changing global environment.